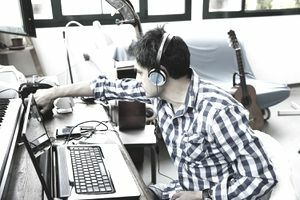 Music licensing and distribution can be incredibly confusing and complicated, with several different types of licenses to distinguish from one another. For composers, artists and musicians, two of the most important forms to consider are sync licensing and master licensing. A sync license is the most popular type of license, particularly for emerging artists. It is an agreement between the copyright holder and a licensee to use the chosen song in a visual element, usually a television show, movie or video game. The money made from sync fees can range from a small fee to hundreds of thousands of dollars. The cost is based on the prominence of the artist and song, how the song will be used and what kind of material the song will be used in. For instance, you will be paid more for a song played in the opening credits of a major motion picture than for a song used in the background of a YouTube video. The composer also determines how much the song is worth. A well-known composer will command more than an up and coming artist, regardless of the song's merit. Another factor determining the money you earn is whether you are selling the song directly or if you are working through a third party, either a site or a professional intermediary. The service used to sell a song will take a cut of the fee as well. A master license is another common form of music license. In this license, an agreement is made between the owner of the master recording, likely a label or company, and the person who wishes to use a song. It gives the licensee permission to use your work in visual projects. While it may sound similar to a sync license, a master license is not as powerful. To use a track in full, the master license is needed along with a sync license. Because labels typically own the mastered recording, they control all licensing agreements. For instance, if a company approaches a significant recording star for a song and she is willing to sell it for $10,000, but the label will only accept $20,000, she has no voice in the negotiation. If the label's price is outside the potential purchaser's budget, they can walk away, and she loses out on that income. When it comes to music and making money, most artists focus only on record sales, signing with labels and selling music downloads. However, those options are just a small sampling of the different ways musicians can make money. Licensing songs, such as through master licensing and sync licensing, can be an excellent method of earning substantial amounts of money. By allowing other companies to use portions of a song or the song in its entirety in commercials or films, the artist can make a large amount of revenue without having to do additional work. Have a library of work available for sync licensing can be a reliable way to earn passive income.